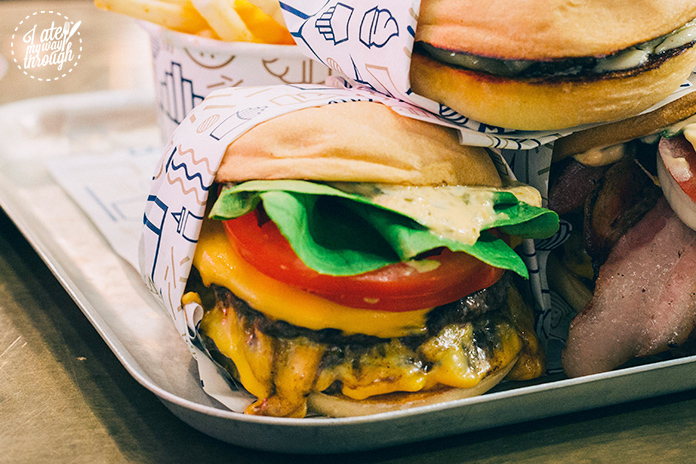 Hailing from Melbourne, Royal Stacks will give Sydney’s Burger juggernauts a run for their money – it really is that good. 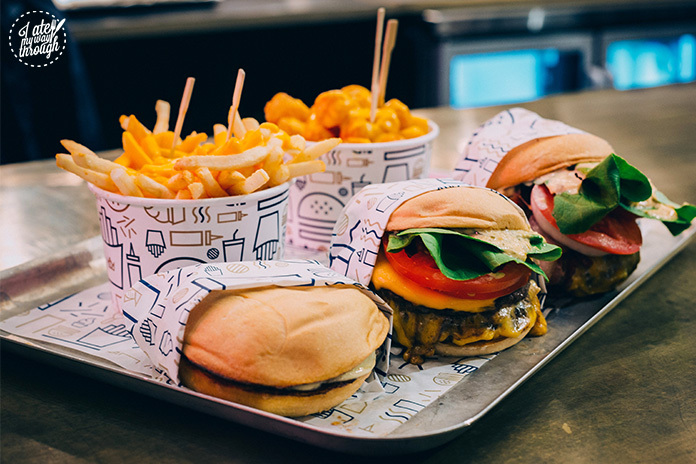 The moment you walk into the Royal Stacks branch in Chatswood you will be greeted by a long line, but not to fear because they pump their burgers out at a relatively fast pace and after meeting Executive Chef Terri Tep, I can assure you that no burger will leave the pass without it reaching her high standard. I was amazed at how consistent each burger looked despite it being incredibly busy at the time I visited. Moving your eyes away from the counter, I personally loved the interior – The dark woods, copper finishes and the contrast of neon against the black and white tones set quite a moody vibe that I enjoy; it was fun and playful, just like their packaging and branding. What I particularly found amusing was how creative the owners behind Royal Stacks got in naming their burgers. Sure they could be referring to the Royal Family, with names such as The King, Prince Harry and (Queen) Elizabeth. Scratch that! I’m sorry, but in my mind there’s only one Queen (Bee) around… and that ends in Yoncè. So without further ado, I present to you our own version of the Royal Stack; a trio as good as Destiny’s Child. Before I delve into discussing our favourites, let’s keep it real and say that many burgers are all pretty similar; there’s the bun, the patty and some salad, the only real differentiating factor is the sauce that brings it all together. Here at Royal Stacks, I must say that where they excel is definitely through their sauces – it is slathered on generously, almost cascading off the side of the burger to create such a mouthwatering masterpiece. An honourable mention should go to the bun. 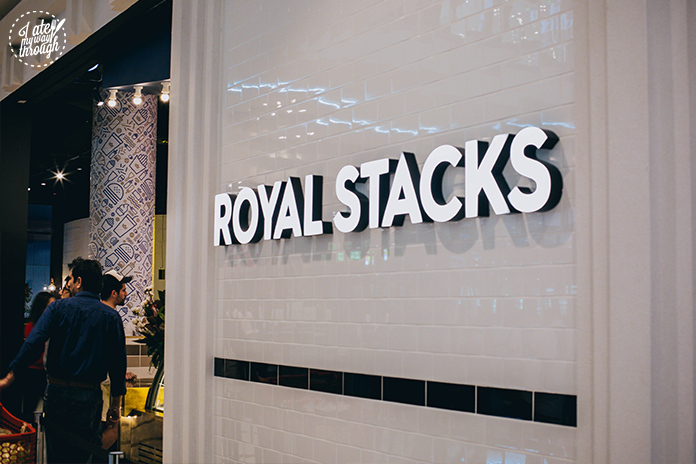 Royal Stacks don’t use the common Milk Bun or Brioche that many -if not all worthy- Burger joints in Sydney use. There was more substance whilst still being light and fluffy, which created a much firmer bite. It was even better when the bun is toasted which gives that signature crust we all love. It for sure is one of the better buns I have ever tasted. “I don’t think you’re ready, for this jelly” introducing the leader of the pack; The Miss Elizabeth ($11.50). What Royal Stacks prides themselves on is the freshness of ingredients, which is why all their beef patties are minced daily. This burger had one beef patty with a layer of Swiss cheese and a smothering of truffle mayo. Sounds beyond basic I know, but don’t be fooled by it’s appearance – it’s rather small in comparison but my gosh did it deliver on flavour. We were in a euphoric high at how good this was and how it was able to take my companions and I right back to the homeland. For any Filipino’s out there, think of this as a gourmet Yum Burger from Jollibee. The patty itself was incredibly juicy with a real meaty texture, giving the burger a firmer bite. The Swiss cheese added a little depth to the taste through its mild smokiness however, where all the flavour came from was that truffle sauce. 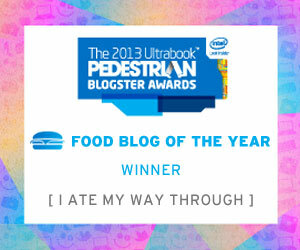 It was so rich, creamy and robust; it was a real triple threat…just like Beyoncé. 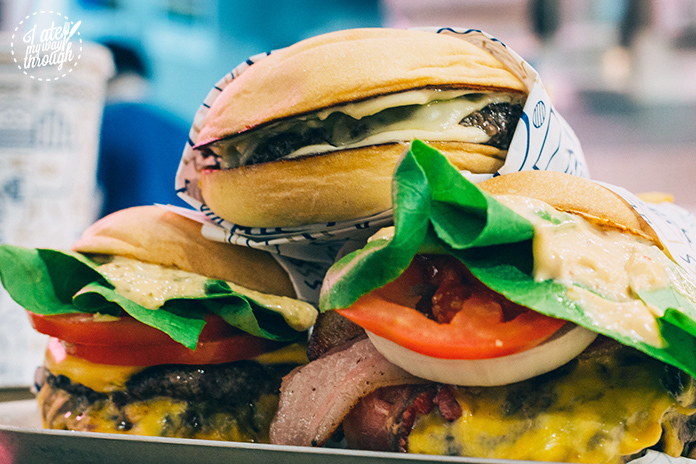 I came here to slay… so I slayed… 2 of these burgers in one sitting. It was a real ‘Treat yo’ self’ kinda day. Next up, to bring the fire to the group and blazing right behind Miss Elizabeth – The Saint ($13.90). 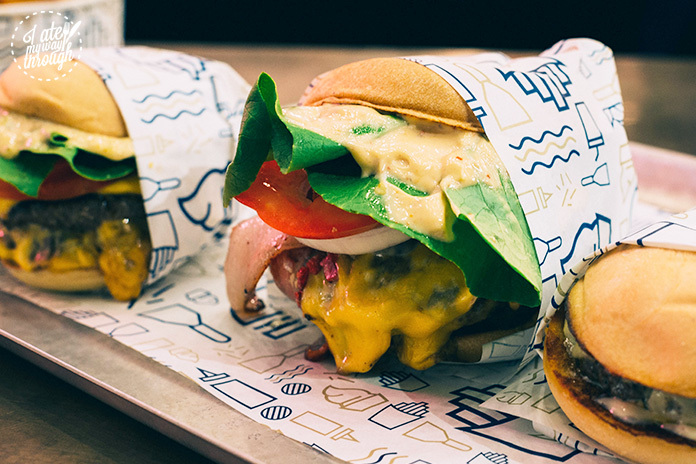 Consisting of 2 beef patties, tomatoes, butter lettuce and a layer of streaky bacon with American cheddar, raw onion… chipotle mayo and pickled jalapenos. Wow. Where do I begin? The rasher bacon was a highlight for me; wasn’t overly cooked to a crisp as it still had texture and certain meatiness and saltiness, which is just the way I like it. The heat from the chipotle mayo and jalapeno trailed behind the meaty taste of the patty, which was pleasant to the taste buds. I didn’t highly rate this burger though, because too many things were happening at once, which over-complicated the flavour profile of the burger. It wanted to be everything…just like Kelly; the second lead vocalist 😂 . However, in saying that if you do like to spice up your life, this burger will do just that, with a heat that creeps up at the end. A for Effort… but find your place in line I say. Second. Who does that leave? Ending this trio is the Double Stack ($12.20)! If you didn’t get it by the name, consisting of 2 beef patties, with butter lettuce, American cheddar, fresh onion and pickles with a generous slather of the special burger sauce. This would be the Michelle of the group. Still likeable but always forgotten… to the Beyoncé of the group. If you’re looking for a clean and simple burger; this is it. It truly lets your savour and concentrate on the individual components of a burger – the bun, the patty and the fresh ingredients. Now moving onto sides, they won me over the instant I saw Tater tots or ‘potato gems’ on the menu. Personally, I think Tater tots are such an underused item on Sydney’s menu. It’s like that underground artist you like trying to make it big – hopeful but highly unlikely. Despite that, Royal Stacks made things even better when I saw Cheese Fries ($5.00) and Cheese Gems ($7.20). 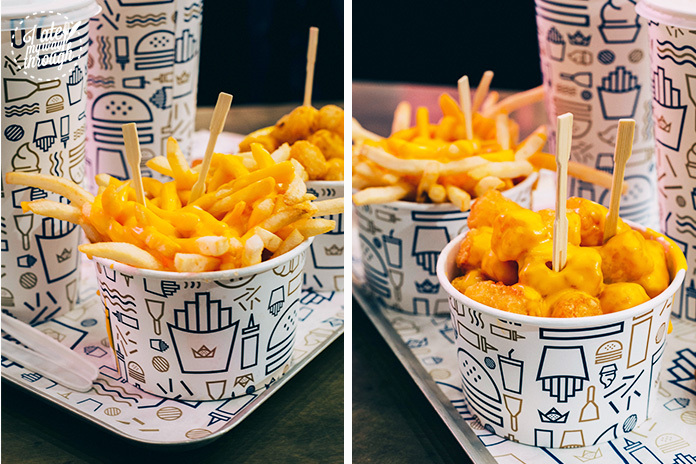 Now Cheese sauce on any fried food is a gift sent from the heavens above but there’s something about it being generously smothered all over Fries or Tots. Fried to perfection with a crunchy exterior and incredibly fluffy innards that’s lightly salted then the cheese sauce comes right in and envelops your mouth with it’s richness. Definitely a must order. I love ending any lunch or dinner on a sweet note, and Royal Stacks would have to be a pioneer in serving up Frozen Custard ($4.50 for 1 scoop) in Sydney because I for one, haven’t seen much around. 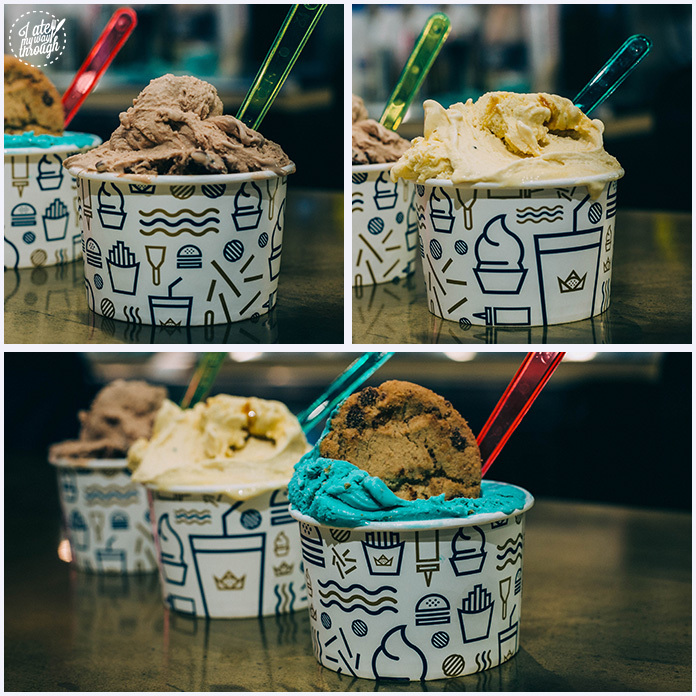 Chef Terri recommended Salted Caramel, Nutella and Sydney exclusive – Blue Cookie Dough. 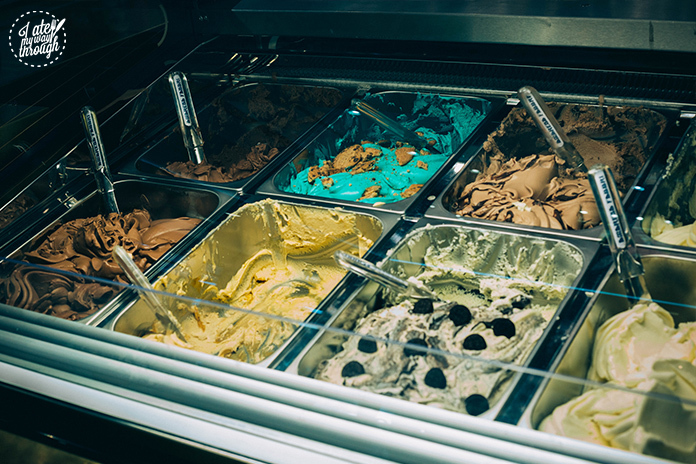 I’ve never had Frozen custard before and what I can say from this experience is that it is much more lighter and richer than ice cream, while still packing an intense flavour – Our taste buds were dancing in routine as we all were amazed at the same time. The Salted Caramel had a rather burnt caramel flavour with a touch of salt within each bite, while the Nutella wasn’t as strong as I would have liked but still reminiscent of the original. All eyes should be on the Blue Cookie Dough though. Looking as if it came straight out of Sesame Street, it is the Cookie Monster in a dessert. With a vibrant blue colour, it’s the first thing that draws your eyes to it. The flavour is what you would expect but what I personally loved was that the cookie used was just a Chips Ahoy cookie that I loved when I was younger. 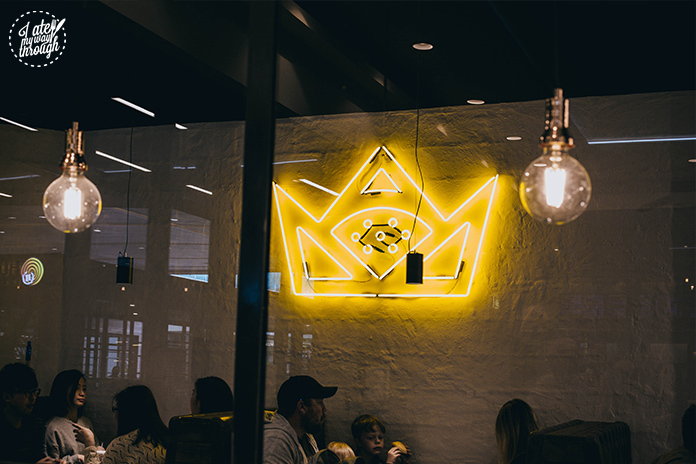 If you are in the Chatswood area, and want a nice, chill spot eatery then Royal Stacks should definitely be on your radar. Though it hasn’t been open for that long, that doesn’t change the fact that they are at such a high level so early on. It’ll be interesting to see where they go from here but in my eyes, the only way is up. Previous articleCirque du Soleil KOOZA: What do the performers eat?